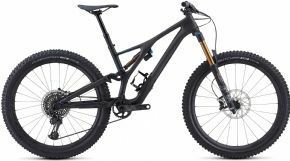 The Specialized Stumpjumper Comp Carbon 29/6fattie Mountain Bike 2018 is no longer available, although you may find similar or newer versions below. It features our FACT 9m carbon fibre for the bulk of the construction in order to provide an ultra-lightweight strong and stiff frame. The carbon moulding process also allowed us to revolutionize how you carry your trail essentials with the all-new SWAT™ Door found at the down tube. This compartment will fit a tube a tool and pump without rattling or compromising the structural integrity of the frame. And to make things even better the Stumpys design also allows you the opportunity to toggle between 29-inch wheels and 6Fattie wheels (not included) allowing the ultimate in configuration options for the trail at hand. Youll also find a fast aggressive geometry to complement the 29-inch wheels that features ridiculously short chainstays a roomy top tube a low bottom bracket and a slacked out front end. And for the build we specd SRAMs GX 11-speed shifting a RockShox Revelation RC fork with 150mm of travel a custom-tuned Monarch RT at the rear and Roval Traverse 29 alloy wheels. Itll change the way you ride. FACT 9m carbon fibre Trail Chassis with Stumpjumper FSR M5 alloy rear end blends stiffness with light weight to form the pinnacle of efficiency while fully enclosed cable routing and an integrated SWAT™ Door create exceptional handling and zero-hassle storage. RockShox Revelation RC fork features a 15x110mm Maxle Ultimate thru-axle a Solo Air™ spring and 150mm of plush travel to take on big hits and bumpy terrain with supreme speed and efficiency. SRAMs 11-speed GX groupset features a wide gear range that delivers climbing and descending efficiency in spades. On top of this the one-by setup is notorious for being next to impossible to drop a chain with plus it provides a significant weight savings in comparison to a standard two-by setup.